The Ultimate Oscillator (UO) is a technical indicator used in technical analysis charting to help find high probability trend reversal points. 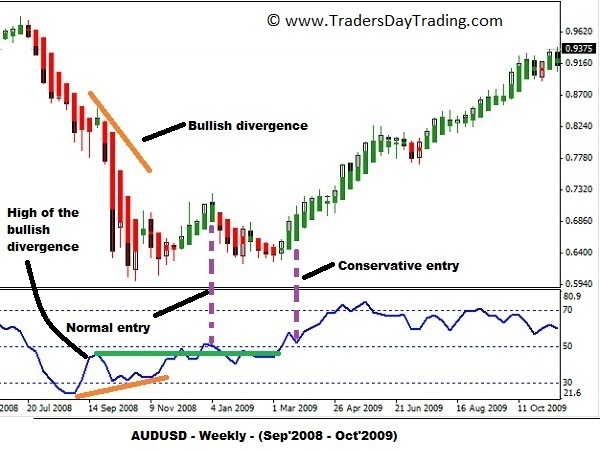 Traders regularly come across false divergence signals while using the various indicators and oscillators in technical analysis charts and the Ultimate Oscillator, which reflects the extent of change in buying pressure in a traded security, was precisely designed to try to overcome this issue. Calculations used in the construction of the ultimate oscillator. Major advantage of using an ultimate oscillator. When to enter a trade. In 1976, Larry Williams, the well-known trader and mathematician, developed the ultimate oscillator to resolve the issue of fake signals generated by most of the momentum oscillators. The indicator was constructed using the weighted average of three periods instead of one, as in the case of other momentum oscillators. This results in unwanted volatility being suppressed from the calculation, thereby avoiding distortion in the representation of the prevailing trend. The main objective of the UO indicator is to reflect the quantum of rise or fall in the buying pressure that causes the price movement. Theoretically, the buying pressure begins to increase or decrease before the actual rise or decline in the price of an asset. Therefore, a precise measure of the magnitude of a rise or fall in buying pressure should enable a trader to forecast the trend in a fairly reliable manner. Buying pressure: Buying pressure (BP) = Close – Minimum. This is determined by subtracting the close and the minimum traded price of a security (current lowest price or the previous close). Quantum of change in buying pressure (gain or loss): This is calculated by measuring the buying pressure relative to the True Range (TR). So, the foremost step is to calculate the True Range which is the difference between the current high or prior close (largest value among the two to be used), and current low or previous close (smallest value among the two should be taken). True Range (TR) = Maximum (High or previous close) – Minimum (Low or previous close). Now, in order to determine the relative buying pressure, n-period sum of BP is divided by the n-period sum of TR. Not one but three time frames are used to create a smoothening effect in order to try to remove volatility. Usually, the default parameters used are 7, 14 and 28 periods. Additionally, to give more priority to the recent price changes, the weighted average of A, B and C is calculated. The multiplication factors (weightage) given to A (shortest average), B (middle average) and C (longest average) are 4x, 2x and 1x respectively. Most charting software packages have provision to change both the input periods, and multiplication factor, according to the individual preferences of a trader. In order to create a binding oscillator, a multiplication factor of 100 is used in the formula shown above. 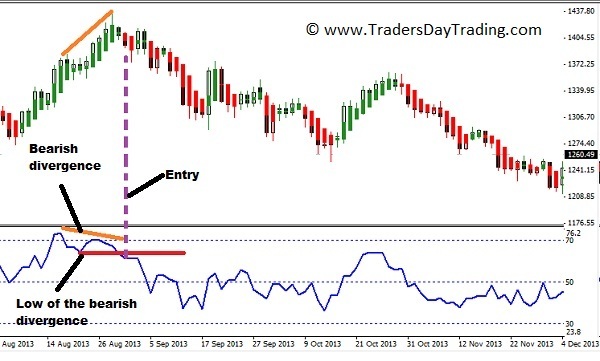 This setup also enables a trader to quickly identify oversold (below 30) and overbought (above 70) levels. The value of the relative buying pressure forms the core of the ultimate oscillator. This is because each and every data used in the construction of the oscillator represents the buying pressure, relative to the current low, or the previous close (whichever is lowest). Thus, the ultimate oscillator value increases when the buying pressure continues to rise and vice versa. It should be noted that buying pressure may or may not be in the primary direction of the price movement of an asset. It is very common for the price to continue to rise or fall very rapidly in the final stages of an established uptrend or a downtrend. Such a scenario usually triggers a lot of stop loss orders and also traps a large portion of novice traders. However, such a sharp movement in price is never supported by a rise or fall in the buying pressure. This is because the smart market participants wait for such moves to exit their current positions, or wait for a reversal. This mismatch is clearly indicated through the formation of a positive or negative divergence pattern appearing in the ultimate oscillator indicator. The ultimate oscillator generates two kinds of patterns, namely, the (bullish) positive divergence and (bearish) negative divergence patterns. A bullish positive divergence is characterized by the formation of a higher low in the ultimate oscillator, while the price of the security continues to decline further producing a lower low before finding support. A long position should only be taken once the indicator breaks out, or crosses the previous high following the bullish divergence. Another point to remember is that the origin (low) of the bullish divergence should be below 30 for the pattern to be reliable. A bearish negative divergence pattern is characterized by the formation of a lower high in the indicator while the price of the price of the security continues to rise further before finding resistance, producing a higher high. Once the ultimate oscillator declines below the low of the divergence, a short position can be initiated. In the case of bearish divergence, the origin (high) of the bearish divergence should be above 70. The notable benefit that arises from the use of the oscillator is the reduction of false signals. UO trading signals may prove ineffective if used as the sole technical indicator for making trading decisions. Professionals always suggest the use of another indicator for the validation of the signal generated. The ultimate oscillator can be an extremely useful technical indicator which reduces the burden of filtering out error signals, thereby allowing better trading decisions. Furthermore, it can be easily combined with other indicators such as RSI, MACD or Elliott wave theory to create a highly effective trading system. Return to Technical Analysis.